This list is regularly updated. Click the button below to be sure you are looking at the latest version. Below is a list of compatible controllers which are known to work with the CronusMAX PLUS. If your device isn't on this list, it doesn't mean it won't work, it just means we haven't tested it ourselves or it hasn't been reported to us as working. Please notify us if you have any information that we can add by posting in this thread on our support forums so we can keep the list current. If you do not know the USB ID (VID/PID) of your controller, follow this guide to discover it. This is where the CronusMAX 'borrows' the security ID of the original controller and spoofs it to the controller you wish to game with - so it passes all valid security checks, also making it stealth and undetectable on PSN/XBL. The following list assumes you are running the latest CronusMAX PLUS firmware. Below is a list of the main wireless controllers which are known to be compatible with the CronusMAX PLUS. PlayStation and Wii Wireless Controllers require a Bluetooth USB Adapter if wireless support is required. As of CronusMAX PLUS Firmware v1.20, PS4 wireless controllers can now be used to authenticate security. As of CronusMAX PLUS Firmware v1.21, more 3rd party PS4 controllers can now be used to authenticate. If there is not a in the authentication column it does not mean it cannot be used to authenticate a controller on a PlayStation 4, it just means we have not tested it and confirmed ourselves. If a DualShock 4 controller can't be used for authentication, it will still work just fine with the CronusMAX PLUS, it simply needs another authentication compatible controller if you want to use it on a PlayStation 4 console. There are also many more PS4 Wired controllers that will work with the CronusMAX that are not on this list, again if you have a controller not on this list it will still probably work. ANY CONTROLLER WITH HARDWARE ID = (054C:05C4) SHOULD WORK. ANY PS4 HID CONTROLLER SHOULD WORK. As of CronusMAX PLUS Firmware v1.21, more 3rd party Xbox One controllers can now be used for authentication. If there is not a in the authentication column, it does not mean it cannot be used to authenticate a controller on an Xbox One, it just means we have not tested it and confirmed ourselves. If an Xbox One controller can't be used for authentication, it will still work just fine with the CronusMAX PLUS, it simply needs another authentication compatible controller if you want to use it on an Xbox One console. There are also many more Xbox One Wired controllers that will work with the CronusMAX that are not on this list, again if you have a controller not on this list it will still probably work. WIRELESS CONTROLLERS REQUIRE A FULL DATA MICRO USB CABLE. XBOX ONE FIGHTSTICKS DO NOT USUALLY WORK WITH AUTHENTICATION. LET US KNOW IF YOUR CONTROLLER DOES. There are also many more PlayStation 3 Wired controllers that will work with the CronusMAX that are not on this list, again if you have a controller not on this list it will still probably work. Some PS3 controllers may require the X-AIM Plugin and a Windows PC/Laptop. This list does not include Flight Sticks/Joysticks - click here for those. ANY CONTROLLER WITH HARDWARE ID = (054C:0268) SHOULD WORK. MOST PS3 HID CONTROLLERS SHOULD WORK. If the PS3 controller is a Fight Stick then it will need the X-AIM, plugin and a Windows PC/Laptop to be hooked up to the Xbox One/PS4/Xbox 360 console. It will also require a custom GPC script to make sure all buttons and are mapped and operating correctly. (If the PS3 Fight Stick has an Xbox 360 mode then the X-AIM plugin is not usually required - sometimes a custom script is needed to mad unusual button layouts or to adjust deadzones). As of CronusMAX PLUS Firmware v1.05 most if not all Xbox 360 controllers can now be used to authenticate. If there is not a in the authentication column, it does not mean it cannot be used to authenticate a controller on an Xbox 360, it just means we have not tested it and confirmed ourselves. If an Xbox 360 wired controller can't be used for authentication, it will still work just fine with the CronusMAX PLUS, it simply needs another authentication compatible controller if you want to use it on an Xbox 360 console. There are also many more controllers that will work with the CronusMAX that are not on this list, again if you have a controller not on this list it will still probably work. Note: You cannot use a wireless Xbox 360 controller with the Xbox 360 Play and Charge Kit for authentication as it does not carry data. If you need to buy a cheap Xbox 360 wired controller for correct security authentication to an Xbox 360 console, CLICK HERE - they're only $14.95. Requires CronusMAX PLUS Firmware v1.24 or above. Click here for instructions on how to setup a XIM with a CronusMAX PLUS. If the Flight Stick/Joystick (including HOTAS 'Hands On Throttle-And-Stick') is a PS3 or Windows PC model, then it will need the X-AIM plugin and a Windows PC/Laptop to be hooked up to the Xbox One/PS4/Xbox 360 console (the ones we and others have tested will have the logo in the X-AIM column). It will also require a custom GPC script to make sure all buttons and throttles are mapped and operating correctly. If the Flight Stick has an Xbox 360 mode then the X-AIM plugin is usually not required (the ones we and others have tested will have the logo in the X-AIM column). These are a range of controllers that are an unconventional design and don't really fit under any specific category. Some will need the X-AIM plugin and a Windows PC/Laptop to be hooked up to the console (the ones we and others have tested will have the logo next to it). This will be particularly true with PS3 or Windows PC controllers. If a controller has an Xbox 360 mode then X-AIM is usually not required. Note: Rock Band drum kits or any other drum controllers such as the ION brand are not compatible with the CronusMAX. The DriveHub is a new product designed to work with most Logitech, Fanatec and Thrustmaster Racing Wheels with a range of shifters, pedals, handbrakes and supports both the Xbox One and PS4. For more information on how to setup and configure Racing Wheels for the DriveHub, please visit the DriveHub Support Section of our Support Community. If you wish to have a more advanced product that is specifically designed for Racing Wheels, we highly recommend the new Drive Hub. Supports most wheels, pedals and shifters including Fanatec (inc. the latest firmware), Logitech and Thrustmaster. 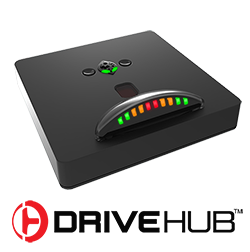 Works on PS4, Xbox One and PS3 with full force feedback. Even supports many accessories such as the TH8A Shifter. No software or extra USB Hubs required. Even converts Fanatec wheels to work fully with GT Sport - CLICK HERE to order. This is a brand new exclusive feature that enables a Logitech G25, G27, Logitech Driving Force GT or one of the listed Fanatec Wheels to connect to a PS4 and detect as a fully compatible wheel with full force feedback support and without the need to use the X-AIM plugin or have a PC hooked up to your console (must be USB Hub compatible version of CronusMAX PLUS with a minimum firmware version of 1.24). The wheel can also be used to navigate the PS4 XMB Menu, which cannot be done without connecting to a CronusMAX PLUS. Note 1: Connecting your wheel using the PS4 Wheel Edition mode requires a compatible USB Hub. Note 2: All compatible Fanatec wheels must be placed into PS3 Mode - click here for instructions on how to do that for your wheel. If you require further support for these wheels and the PS4 Wheel Edition Mode, visit this dedicated section of our support forums. You'll find lots of help on settings for various games. (CSL Elite and CSW v2.5 don't have PS3 Mode therefore are not compatible with the PS4 Wheel Edition feature). Note 3: The Porsche 911 Turbo Wheels require the latest Fanatec Firmware and need to use a USB cable without the RF module. Note 4: Firmware 299 is not compatible. Downgrade to an earlier version such as 204. All brands of mouse and keyboard are compatible with the CronusMAX PLUS, however we work with 5 particular models of gaming mice in our official Keyboard & Mouse Setup Guides. These were picked for their quality, popularity and price range. If you are looking to purchase a gaming mouse to use with the CronusMAX PLUS - these are highly recommended. Note 1: Keyboard & Mouse gaming requires the X-AIM Plugin and a Windows PC to be connected to your CronusMAX at all times. Note 2: The Polling Rate of your mouse should always be set to 500hz when possible. If your mouse is set to a higher frequency, like 1000hz - which is usually the default setting, this can cause strange behavior in X-AIM and your settings will never feel 1:1 as if you were PC gaming - and this is just one setting, there's a lot more. But once you have everything configured correctly, it's REALLY worth the effort. Note 3: All official mouse setup guides for the above models are posted in this section of the CronusMAX PLUS Support Forums. Microsoft®, Sony®, Nintendo®, Logitech®, Scuf Gaming®, Thrustmaster®, Fanatec®, Joytech®, Aimon®, Namco®, Qanba®, Hori®, Razer®, PowerA®, Pelican®, Mad Catz®, PDP®, Saitek®, Datel®, Splitfish® are trademarks of Microsoft Corporation, Sony Corporation, Nintendo Co., Ltd., Logitech International S.A, Scuf Gaming International LLC, Guillemot Corporation S.A, Endor AG, Landshut / Germany, Tuact Corp., Bandai Namco Games Inc., Shenzhen Qanba Technology Development Co., Ltd., Hori Co. Ltd., Razer Inc., Bensussen Deutsch & Associates, LLC., Performance Designed Products LLC, Mad Catz Interactive, Inc., Saitek Ltd., Logitech International S.A, Datel Ltd. and First Holding Ltd.